I had such a hard time deciding on a theme for this weekend. I was going from several sounding good to not in the mood for any of them. Then I was sitting here thinking about all the different themes I could do when it hit me all at once. I will do them all! I will have a multi-theme marathon. Maybe I will start out with a double feature of an actor or actress that I like. And after that maybe I will decide to watch all 3 Spider-Man movies. Then after that maybe I will have a Lost Boys double feature. The possibilities are endless. - Julie Benz Double Feature - I have liked her since seeing her in Buffy and Angel as Darla. I have a couple of movies with her on DVD... so maybe. Do any of those sound interesting to you? And maybe you have a good suggestion for a mini-marathon (Think 2 to 3 movies). OK Jimmy... they have been in my unwatched collection for many years... and this does seem like the perfect opportunity to get the watched. It won't be the first double feature I do... but I will get to them at some point this weekend. I personally like the sound of a Giant Lizard Triple Feature. Id like yo see your opinions on those two Prom Nights though.... I personally thought they were pretty bad. It isn't a particular release called "The Giant Lizard Triple Feature"... I meant I would create my own with the single release DVDs that I own. I am sure I will get to the Prom Night ones... as I been wanting to watch them since I found out Nicole deBoer is in the last one. All over the world, the fires are dying. The planet will become an icy wilderness. Mankind is threatened with extinction. At the heart of this fiendish plot lies Hera, Queen of the Gods and Hercules' implacable enemy, who has taken the eternal torch before it is extinguished. Many dangers lay in wait: an invincible giant, a treacherous wood sprite and the wrath and jealousy of his father: Zeus, king of the gods. But Hercules must not fail; if the Eternal Torch dies, all life dies with it. When I thought back to these TV movies I thought I remembered only really liking the first couple (Hercules and the Amazon Women & Hercules and the Lost Kingdom) but I was remembering that wrong... as I really did enjoy this one as well.... much more then I remembered. In this movie he meets Deianeira who we later find out becomes his wife. When a beautiful young girl asks Hercules to save her city from an abyss that has opened there leading straight to the Underworld, Hercules leaves his family to help her. But the evil centaur Nessus plants the seeds of jealousy in Deianeira's heart, driving her to kill herself in her despair. Now it is up to Hercules to leap into the abyss of death to rescue his wife and all mankind. And once again... my memory failed me as I did indeed enjoy this one just as much as the first one I watched today. I like how they did the underworld... and I liked the three headed dog. I am surprised how much I enjoyed these last couple as I could have sworn I didn't care for them as much the first time I watched them. Maybe I was just thinking the last one... which I am now about to find out. Hercules discovers he has a half-brother he never knew, but more importantly that Zeus was forced by his brother's evil behavior to punish him by changing him into a monster trapped in a maze. 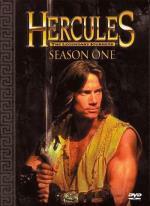 When some young men accidentally find their way into his lair, it's up to Hercules and Iolaus to save the day. 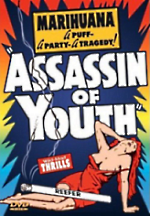 Seriously I like them : Assassin of Youth is an exploitation classic and Reefer Madness is funny in a WTF way. A high-school girl gets involved with a ring of teenage marijuana smokers, not realizing that she is being framed by greedy relatives out to prevent her from getting an inheritance, and starts down the road to ruin. A reporter poses as a soda jerk to infiltrate the gang of teen dope fiends and save the clean and wholesome youth of the town from the horrors of marijuana addiction. What do I think about this movie? I really not sure. I think I found it kinda boring as I struggled to keep my attention on the movie at times. But at the same time I had to laugh at some of the things they said in this movie. Now I personally never even tried any type of drugs... I don't smoke (anything) and I don't drink. But even I know better then to link marijuana to murder! But hey... I did learn something... the easiest way to get a woman's clothes off is give her some marijuana! I swear some of the stuff they came out with is ridiculous... even to me! But at least it did seem like they tried to make a decent story. I think I have to give this one about a 2.5... I didn't really hate it... but it is not something I see myself watching often. No more then an average movie. Believe it or not, I never watched the Hercules series. My Hercules was the movies starring Steve Reeves of the 1960s. Is any cable channel showing this show now? I doubt I'll ever buy it but if it were on TV, I might check it out. 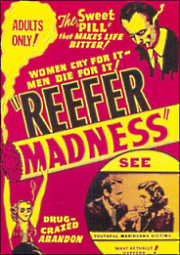 Propaganda film that relates the story, as told by high school principal Dr. Carroll to parents at a PTA meeting, of the scourge of marijuana. The tale revolves around Mae and Jack, accomplices in the distribution of marijuana, who manage to entice the local high school kids to stop by Mae's apartment to smoke reefer. The lives of all who are involved with this menace are inevitably shattered. One man becomes so addicted to the killer weed that the guilt over framing a teen for murder causes a judge to order him to be committed for life to a mental hospital! Dr. Carroll closes by advising us to not incur the same tragedy. This movie also had it's moments... but another one that I just find to be an average movie. Not something I can see myself watching often. Just don't think these movies is my thing. Unfortunately the copy of this movie that I have is in pretty bad shape. The bad video was pretty distracting.